Leather Norman Knight Helmet. 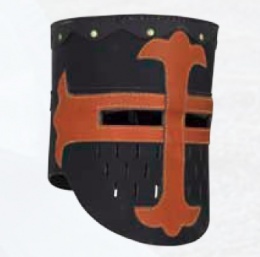 This helmet represents the classic crusader style helmet that featured incredible protection to the face. It typically contained wide eye slots for improved visability and plenty of vents across the face for easy breathing. Our version is made of authentic leather and is fully functional and wearable. late 12th century nasal helmet-This helmet had a flat top and a square profile. This form of nasal helmet was the forerunner of deeper, cylindrical helmets with greater facial protection, enclosed helmets, and eventually the great helm. The existing nasal formed the basis for increased facial protection, eventually, by 1200, producing a face covering plate which was pierced for sight and ventilation. This page was last modified on 29 May 2014, at 18:59.